Closed cell foam sleeping pad-minimum size = 3/8" x 20" x 48"
February offers the most brutal environment an Alaskan winter can summon. Fortunately, near-death experiences in the race are rare, but competitors have and will continue to suffer frostbite and hypothermia, the two principal pre-cursors to tragedy on the course. This fact alone justifies the continuing requirement to carry mandatory gear. No element of the race has been more controversial than the mandatory gear rule and its enforcement (or perceived lack thereof). As every endurance athlete understands, the minimization of weight and volume are crucial strategies in competition. Hence the temptation to cheat on the mandatory gear. Although we use pre-race, random in-race, and some post-race gear checks to keep the playing field level, The Susitna 100 relies largely on the honor system. No Susitna 100 winner has ever been invited to the White House or signed a million-dollar endorsement contract. For the most part, we show up, race, have a party to celebrate, and get back to life. As Abe Lincoln said, the world will little remember what was done here. Put simply: please don't cheat. There is a good selection of lightweight synthetic bags that will meet this requirement. However, your best bet is to get a down bag, preferably with a goretex shell (in case you actually do have to use the bag). Down fill is still lighter and more compressible than any synthetic fills of comparable insulation rating. Be aware that the insulating value of sleeping bags degrades over time and is quite sensitive to the care the bag receives from its owner. Thus the label you show the Susitna 100 official at check-in may indicate that the bag meets the specification, but your personal field-test may determine a much different (and quite uncomfortable) rating. Some racers sleep during this race. If you stop for a few winks, don't expect to find floorspace at a checkpoint. 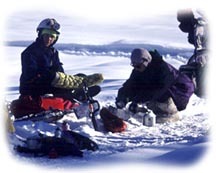 In short, think about your race plan and factor in how you plan to bivouac in the open at 20 or 30 below zero F.
Your cheapest, lightest, and warmest choice is a closed-cell pad, such as a Ridgerest or blue foam pad. No inflatable sleeping pad is acceptable. Minimum size is 3/8" x 20" x 48". A goretex bivy sack is recommended. If you're not into ultra-light hiking and/or climbing you probably don't own one and the $100+ cost may be prohibitive. The one-person tents marketed to bicycle tourists are fine, but will add some ounces to your gear. Again, you're not likely to use this equipment. But if you do, it's important that your bivy sack be waterproof, especially if your sleeping bag isn't. If you do bivouac, dig or stomp out a trench in a snow bank (not too far off the trail) and use the trench for wind protection and extra insulation. The rule requires that you have at least a two-quart (64 ounce) capacity. If you dress properly and avoid sweating, this should be enough to get you between checkpoints. A special note to runners and snowshoers: you will be constantly cycling between hydration and dehydration and you must be disciplined about re-hydrating at checkpoints. It is advisable to carry an extra quart bottle (start with it empty) just in case you figure out that you are not keeping up. Outdoor Research (OR) makes nice bottle jackets. If it's a cold year (or you are broke), you can make your own out of a sheet of one-inch foam rubber and some duct tape. The plastic bladder (Camelbak, Platypus, or other name brands) is overwhelmingly the weapon of choice. Most competitors are well-informed as to their virtues. Bladders, however, aren't trouble free. Racers must be alert to the tendency of hoses to freeze, especially during the longer periods between checkpoints with which runners and snowshoers must contend. Clear the tube after drinking by either blowing back into the tube or raising it while pinching the tip. In 1993, a racer got second-degree burns on a good portion of his back when his bladder was filled with near-boiling water. He was a mile or two out of the checkpoint, with the bladder buried under layers of clothing, before he realized he was about to become a soft-boiled egg. Think about the outside temperature and the body heat you're generating when you fill those bladders. They can provide a welcome heating pad during a cold stretch or they can turn your clothing into a steam room and sweat you to dehydration. Bladders can and will leak or siphon their contents everywhere but where the fluid needs to go: into your mouth. Avoid these problems by selecting a dependable valve and then gluing or taping it onto the tube. As with all of your equipment, work with your drinking system, under winter conditions if possible, before the race to find and cure its weak points. Winter nights in Alaska do not typically have the same intense darkness you encounter in warm climates where there is rarely any snow. Snow is highly reflective and can achieve great definition with even a small amount of light. However, because some sections offer technical riding on the course, avoid the temptation to cut corners with your lighting system. The wilderness through which the Susitna 100 is run is criss-crossed with a number of winter trails. The race course intersects many of these trails, some of which have proven quite alluring. Every year someone gets lost. After 5:30 PM, your headlamp is the best friend you have. The course is well-marked with reflective tape posted on trees and wooden stakes, albeit vulnerable to the vandalism shiny objects everywhere attract. A long, wide beam of light will catch these markers without any special effort on your part. Most racers use LED lights. Even though these generally have long run times, bring extra batteries with you. For traveling at night or camping, a small flashing light will alert snowmachines and other people on the trail as to your presence. If you camp for the night, hang the light from a nearby tree, a ski pole, or your bike, so roving race officials can take note of your location. The rule now states that you must leave the last Checkpoint with one day of food. Food and drink mix should total 3,000 calories. A lighter is recommended. Some racers wear them on a cord around their neck. Matches work great when the sun is up, the wind is down and you have all day to get the fire started. Waterproof windproof matches help. You can really have fun with this one. Although we no longer require competitors to melt snow before completing registration (too bad, it created quite a few comic moments), you are advised to test your system before packing it away. A conventional approach is to pack an MSR-type stove (such as the Whisperlite or XGKII) with an 11 ounce fuel bottle filled with white gas. It's a bit more weight, but reliable and reusable. Make sure to bring a portable kettle/pan/pot. A stove is completely optional. You will have limited opportunities to beg, borrow, or buy food along the trail; hence plan on being completely self-sufficient for calories. All the checkpoints will have water, so bring lots of drink mix to add calories, electrolytes, caffeine, and other good stuff to your body. Unless you are willing to carry the food next to your skin, choose food that does not freeze solid at extreme temperatures. Some racers carry food to be heated up on the wood stoves at the checkpoints, such as foil wrapped pizza or sandwiches. No conventional cooking appliances are available for racer use. You should be prepared for a 40-50 degree temperature swing during the race. In addition, the wind often picks up at night, adding a nice cool tingle to the evening air. Be prepared with lots of neoprene and similar air-tight gear. Think about a change-out of your upper body layers as the sun goes down. You will likely be a bit dehydrated by then and- combined with the cooler ambient temperatures- sweating a bit less. Dry clothes will feel much nicer. Much of the course will be within reach of Anchorage's many radio stations. A radio or mp3 player weighs but a few ounces, but can lighten your spirits as you trudge down the course. Keep the batteries next to your body. Duct tape can provide quick but effective repairs to sleds, torn clothing, and cold noses (no kidding!). Bring a knife or micro-leatherman tool and a little extra rope as well. If you're relying on a water bladder, think about bringing 1 water bottle, just in case! It goes without saying in an ultra-distance event to bring a foot repair kit. Since most of us err on the side of caution in selecting foot wear, foot powder should be applied liberally at all extended rests at checkpoints. Cell service is spotty at best. Do not rely on your cell phone while racing.